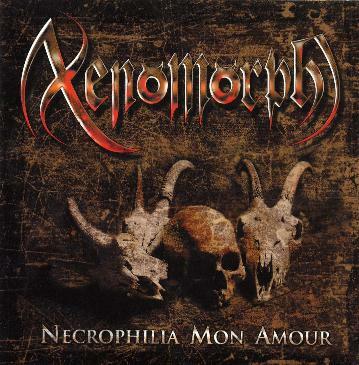 Xenomorph - "Necrophilia Mon Amour"
I guess you could probably figure out from the title of the CD and also the record label that this is some pretty intense black metal. This is the first release on the Under Her Black Wings label, which is a sub label of the Dutch Freebird label that has released Astronsoniq, Dexter Jones Circus Orchestra, Wallrus, and Mugwumps. Anyway, this is some intense stuff as all black metal is. I was a little let down that there were no guitar solos. Just pure riffing all the time. The bass lines are quite awesome and when the singer (if you can call these type of vocals singing) speaks, he has a very cool voice. The lyrics are enough to make you not sleep at night for sure and with song titles like "Magnificat My Soul Doth Magnify the Lord and Hang 'em on Holocaust stakes of Frozen Methane", this is scary stuff. For more information you can visit: http://www.freebird-records.com.